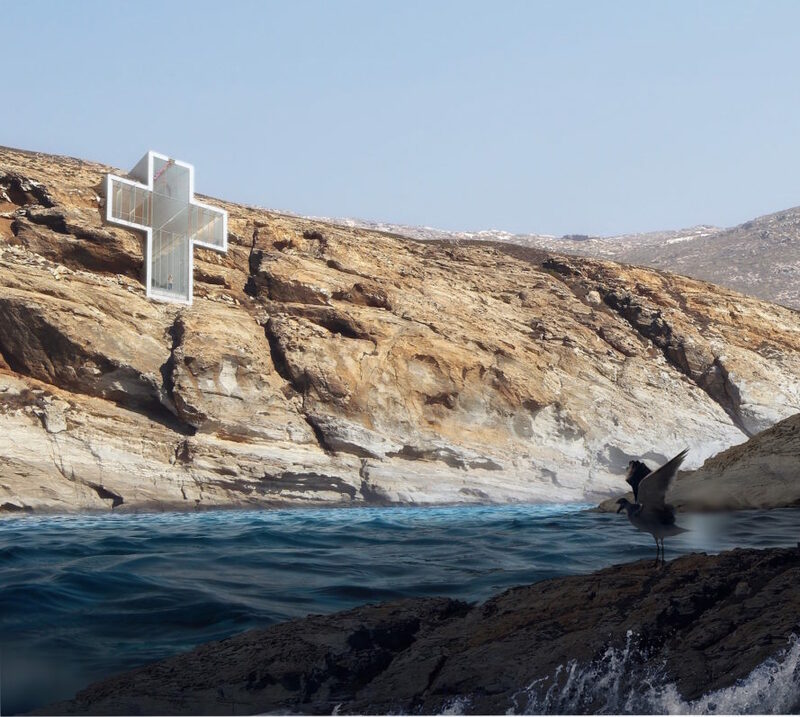 Open Platform for Architecture (OPA) has unveiled yet another breathtaking cliffside building—a cross-shaped chapel embedded into a rocky cliff with dramatic views of the Aegean Sea. Dubbed Lux Aeterna, or Holy Cross Chapel, the chapel was crafted in a style OPA calls “Transcendental Brutalism” for its embrace of concrete, ruggedness, and spectacular views. OPA is perhaps most famous for their jaw-dropping Casa Brutale, another cliffside building with confirmed plans for construction. 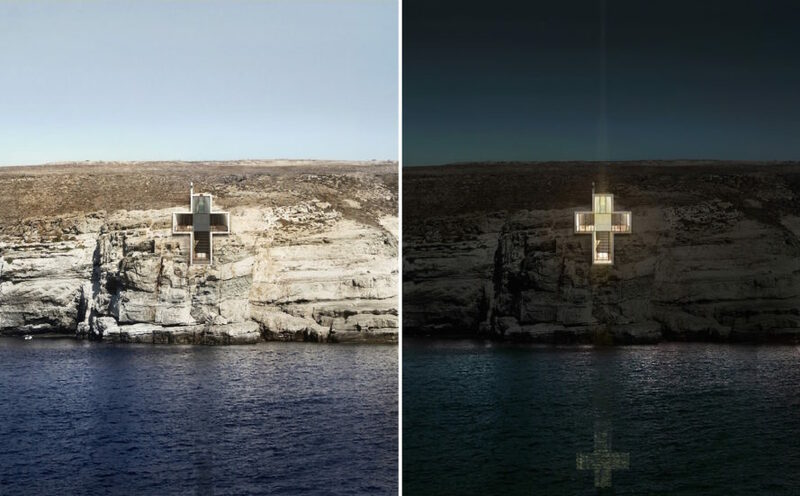 Like its predecessor, Lux Aeterna is dramatically embedded into a rocky cliff and sports a giant cross-shaped facade made of glass that gives the building the appearance of a glowing lighthouse at night. Guests enter the underground chapel via a series of concrete steps that lead down into the earth, which helps create thermal insulation to regulate internal temperatures. The interior is minimally decorated and made almost entirely from concrete save for the timber flooring, benches, and door that lend the space a touch of warmth. Aside from the giant east-facing glazed cross, stained glass decorates the other openings. Colorful cross-shaped skylights create a beautiful play of colored light inside the chapel. OPA is perhaps most famous for their jaw-dropping Casa Brutale, another cliffside building with confirmed plans for construction. 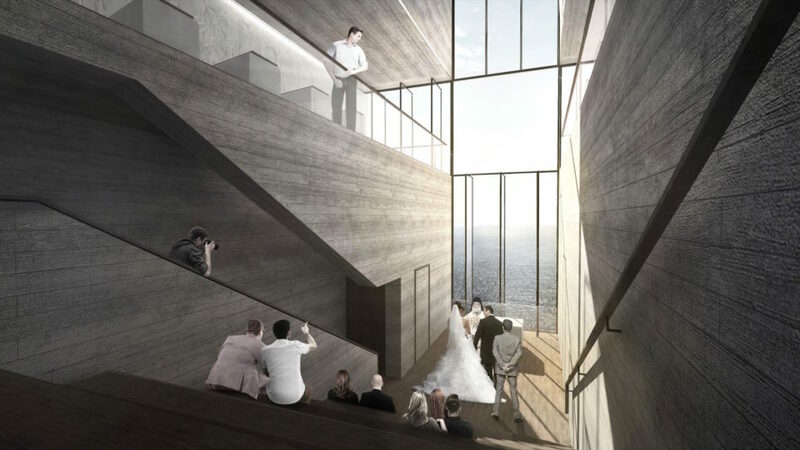 Like its predecessor, Lux Aeterna is dramatically embedded into a rocky cliff and sports a giant cross-shaped facade made of glass that gives the building the appearance of a glowing lighthouse at night. Guests enter the underground chapel via a series of concrete steps that lead down into the earth, which helps create thermal insulation to regulate internal temperatures. The interior is minimally decorated and made almost entirely from concrete save for the timber flooring, benches, and door that lend the space a touch of warmth. Aside from the giant east-facing glazed cross, stained glass decorates the other openings. Colorful cross-shaped skylights create a beautiful play of colored light inside the chapel.